A blog full of all things story related. There are book reviews, movie reviews, TV show talkings, and many other things. I had heard this title floating around before with great things being said about it, so I decided to pick it up. 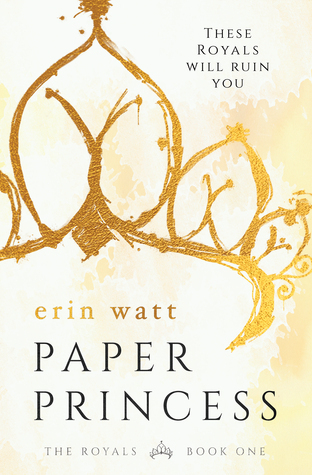 Paper Princess was good, but I'm not sure if it lived up to the hype that was surrounding it for me. I still enjoyed it! But at the same time, I would not recommend it to all my friends and I don't think it would be one of the top books I would recommend. It was a very interesting and the writing was so easy to read. There were just one too many really uncomfortable moments for me, and I think part of the reason that they were so uncomfortable is because we suddenly meet these Royals and they aren't developed so well...... There's definitely lots of room for them to grow and develop, which I am really hoping happens in the next book. Which, by the way, I will be reading. This book may have just not been my thing, so if you are looking for a new adult romance, then this will definitely fit the bill. Ella: While I love how her character is so independent and strong, but she's also rash. A part of me actually appreciates this aspect of her character because it is a reminder that she is still only 17 and does not have the maturity of an adult, nor should she, even though she has had to take care of herself for the past two years. Reed: When I said earlier that there is room for these characters to be developed, I was thinking especially about Reed. The thing is, he is developed really well in book 1, but I feel like there is still more to him that could be developed in the next book. He is like the dad of the family. That is my current hypothesis at this moment. His own dad is always gone and he cares so much about his brothers that I think he has taken over the responsibility of looking out for them in whatever way he needs to. *cough the ending cough*. I don't think (I hope) that he ended up sleeping with Brooke at the end because of some ulterior motive. I really hope so, and I think that goes with his character too. I'm trying to figure out right now what the major plot line was. Ella gets taken to rich neighborhood. She meets creepy bratty family. Earns their trust. Trust broken. There were no really compelling plot lines in the book. The entire thing was about Ella and Reed. Huh. The writing was easy to read, and I think the only spots where I wasn't necessarily enjoying the book weren't out of the words so much as the character development and lack of knowing the Royals. If the family is developed more, I think I would enjoy this book a lot better because then I think a lot of the creepy factor would be taken out. They would seem more human to me? And by that I mean that they would seem more humane and less inconsiderate. I'm pretty sure I have said stuff like this in other reviews, but just because I did not love this book does not mean other people won't too. Who knows- maybe I'll love the next two books. I personally found the character development to be lacking, and as a result of that, there were times that I was really feeling a creepy factor and I did not enjoy that. I will continue on with the next book though, because I really am hoping that the characters will be developed more and we get to know them better.